Store in a cool, dry place out of the reach of children. Keep away from direct sunlight., Do not store below 4°C. Dosage 4.5 kg wash Water Hardness Light Laundry soiling Normal Laundry soiling Heavy Laundry soiling Soft 30ml 30ml 45ml Medium 30ml 30ml 45ml Hard 45ml 45ml Add an extra ½ capful Handwash Dilute half a cap in 5 Litres of water Maximum 6-8 kg machines: Add an additional ½ capful to the recommended dosage. *The standard number of washes (21) is based on the dosage for normal soiling in medium water hardness. Dose = 30 ml, fill to line in cap. Using the measuring cap provided, pour the liquid into the dispenser of your machine. Rinse cap after use. For best results use in the washing machine drawer. Always follow garment manufacturer's washing instructions. For problem stains pour the liquid directly onto the stain and wash immediately. 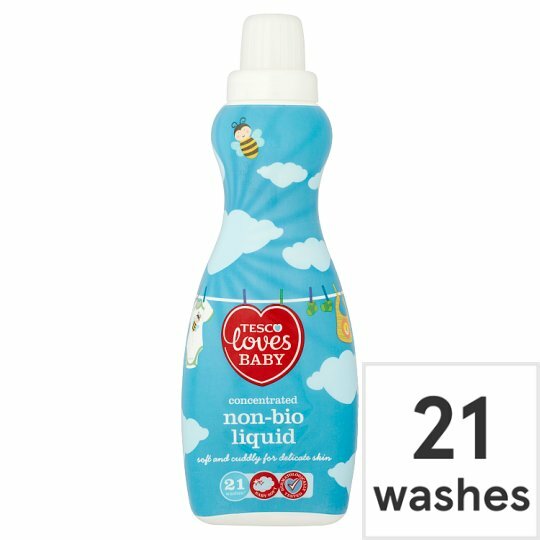 Tesco Loves baby concentrated non bio laundry liquid, DANGER, Causes serious eye damage., If medical advice is needed, have product container or label at hand., Keep out of reach of children., Read label before use., Wear eye protection., IF IN EYES: Rinse cautiously with water for several minutes. Remove, contact lenses, if present and easy to do. Continue rinsing., Immediately call a POISON CENTER or doctor/physician., Produced in Belgium for, Tesco Stores Ltd., Welwyn Garden City AL7 1GA, U.K. (c) Tesco 2017 SCCE1156, Freephone 0800 50 55 55, Mon-Sat, 9am-6pm.